Racetrack outriders are responsible for maintaining a safe environment at the track during morning workouts and live racing. An outrider is responsible for ensuring the safety of all horse racing participants (both human and equine) during training and live racing. Outriders generally use their own personal horses to carry out their duties, and many have multiple mounts available to use throughout the day. Outriders are responsible for opening and closing the track each day, and clearing equine traffic when necessary so that harrowing and maintenance can be performed at designated intervals. They catch loose horses on the track as quickly as possible, minimizing the chance of an injury or the need for a late scratch, and bring them to the on-track veterinarian for evaluation. They also help riders who are having trouble with difficult horses, particularly when a horse tries to run away with its rider. On race days, an outrider leads the post parade and escorts the winning horse and jockey back to the winner's circle. Outriders are also tasked with enforcing the rules of the track and documenting violations, injuries, or cases of individuals engaging in unsafe riding. They are required to report these incidents back to the racing stewards. They also must make sure that all required safety equipment is in use (i.e., helmets and vests) by riders at all times. Outriders anticipate potential problems, communicate with each other and racing officials via radio, summon the ambulance for fallen riders, and assist with loading injured horses into the equine ambulance. The exact number of outriders can vary from one track to the next, but most facilities have at least two outriders on hand during morning workouts, and three or more on duty during live racing. Training centers also may have one or more outriders present during training hours. One will act as the “lead” outrider and coordinate with the assistants. The team of outriders makes sure that they are strategically placed to provide coverage throughout the track, with at least one outrider taking a position behind the starting gate and one in front of it to ensure a fast response to any incidents. Outriders regularly interact with exercise riders, jockeys, trainers, stewards, and other racing personnel. 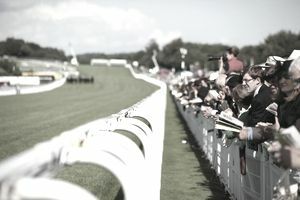 They also interact with children and fans on the rail, posing for photos and letting them pet their horses while waiting for the action to begin. Outriders work outdoors in widely varying temperatures and changing weather conditions. They commonly work 5 to 6 days per week, and these hours may include weekends, evenings, early mornings, and holidays. Outrider positions are most frequently found at Thoroughbred racetracks and training centers, but opportunities may also be found working at tracks that cater to other racing breeds such as Quarter Horses and Arabians. Outriders may transition to a wide variety of roles in the racing industry such as exercise rider, trainer, foreman, bloodstock agent, and many other positions (both mounted and non-mounted). While no formal degree or occupational training is necessary to become an outrider, tracks often require candidates to be at least 18 years of age and in possession of a high school diploma or equivalent GED. They must also be licensed to perform the duties of an outrider by the state racing commission. Licensing generally involves being fingerprinted and paying a licensing fee, which ranges from as little as $15 in Ohio to $100 in Kentucky. Most successful applicants for outrider positions have extensive experience working with horses, especially in the racetrack environment. They commonly start out as hot walkers, exercise riders, or pony-to-post riders before advancing to the outrider team. It is critical that outriders have expert riding skills and an excellent working relationship with the horse that they are riding while completing their duties. A strong knowledge of equine behavior is also necessary, as this allows an outrider to anticipate problems before they occur or to predict what a loose horse will do while attempting to evade capture. Compensation for outriders can vary widely based on the individual’s level of responsibility, years of experience, and the geographic location in which the position is located. Outriders are usually paid on a salary basis by the track. Due to the relatively static number of tracks and racehorses competing in the United States, there will not be much of an increase in demand for outriders over the next decade. Some turnover can be expected, however, as current outriders retire or seek other roles in the racetrack hierarchy.